PolitiFact Wisconsin checks up on Foxconn. 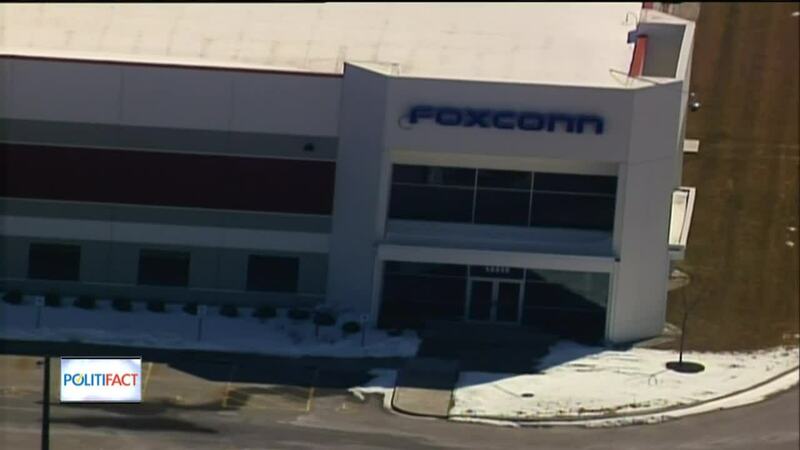 There's a lot of news surrounding Foxconn after conflicting reports regarding the company's commitment to Wisconsin. PolitiFact Wisconsin takes a look at a claim about tax incentive dollars for the Taiwanese company. Will they stay or will they go was the question surrounding Foxconn before the company reaffirmed its commitment to building a factory in Mount Pleasant. State Republican leaders Robin Vos and Scott Fitzgerald put minds at ease over the nearly $3 billion in tax incentives the company will receive if it creates up to 13,000 jobs. "Their claim was that not a penny of state tax money would go to Foxconn unless jobs are being created," said Greg Borowski with the Milwaukee Journal Sentinel. PolitiFact Wisconsin says it is important to understand what Vos and Fitzgerald were referring to. "The first thing to consider is that the bulk of what they're talking about are these incentive dollars that are connected to jobs," said Borowski. "In fact, Foxconn did not meet its target at the end of 2018 and so far has not received any of that money." PolitiFact Wisconsin points out there is a wrinkle with their claim. "Foxconn also gets a big tax benefit on construction-related projects in terms of the sales tax being waived which can save $100 million or more. If you look at just job-related incentives, PolitiFact Wisconsin says Vos and Fitzgerald hit the point on the nose.